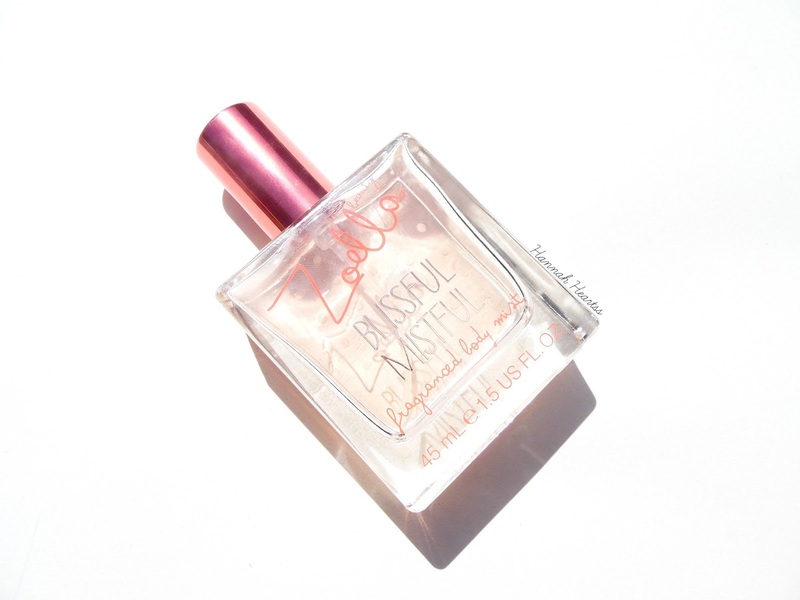 One of my favourite products from the Zoella Beauty range is the body mists. I must prefer to use body mists over perfume because I change my mind about what scents I like almost every week and find them to have as good scent kick off as some perfumes at a much cheaper price. When Zoella released her new Tutti Fruity line (you can check out my first impressions here) I was so excited to see a second body mist fragrance. I must admit, Zoe knows what she is doing with the packaging - simple yet cute. The packaging on both Blissful Mistful and Let's Sprtiz are very similar just with different colours and patterns which I think fits with the products well. Blissful Mistful has a orange theme to it and has a gorgeous and simple polka dot design on the back of the bottle which looks so pretty when it peaks through from the front. Let's Spritz's packaging is my favourite out of the two and is perfect for the current Summer. Each of the bottles are the perfect size and aren't too big that you could just pop them into your handbag and because they have a cap over the spray you don't have to worry if you do pop it in your bag as it won't spray on its own. Blissful Mistful is a fragrance that is perfect for year round. It is very fresh with a slight hint of floral and fruitiness to it which I really love. I didn't think I was going to like this scent as much as I do as I am normally a big lover of fruity scents but it is nice to switch it up every now and again. I find this scent to be perfect to wear on those rainy summer days or just to chuck on throughout the day. I think this scent is aimed more towards the older teen/young adult as it is a slightly older fragrance, not so much for her young target audience but I like that! From the new Tutti Fruity collection is Let's Spritz and this is my favourite out of the two I must admit. This has been released at the perfect time as it is a gorgeous Summer fragrance, this is a very fruity fragrance. But it isn't too sticky sweet as it has that fresh element to it which also makes it perfect for me to wear as it isn't too young. I don't think this scent is going to be for everyone, I think it is quite love it or hate it but I loooove it. I wouldn't describe this scent as being 'Tutti Fruity' though but I am pretty rubbish at describing scents so give it a sniff next time you are in Superdrug! Both fragrance body mists last quite a while on the skin, obviously they aren't going to last all day because they aren't perfumes and at £8 each I think it is perfect to pop in your handbag so you can reapply as and when needed. Blissful Mistful and Let's Spritz retail for £8 each and are available in Superdrug stores and online at Feel Unique and Superdrug - link.